(Click underlined title to see more pictures and info) Phlebodium aureum, fern, standard form, in landscape in Pt. Loma, in a sort of 'habitat styling'. Goes great with Malvaviscus, which is a few entries before/below in this blog. Both are native to southeast North America through portions of gulf-region Mexico, Central America, Caribbean, and northern South America. 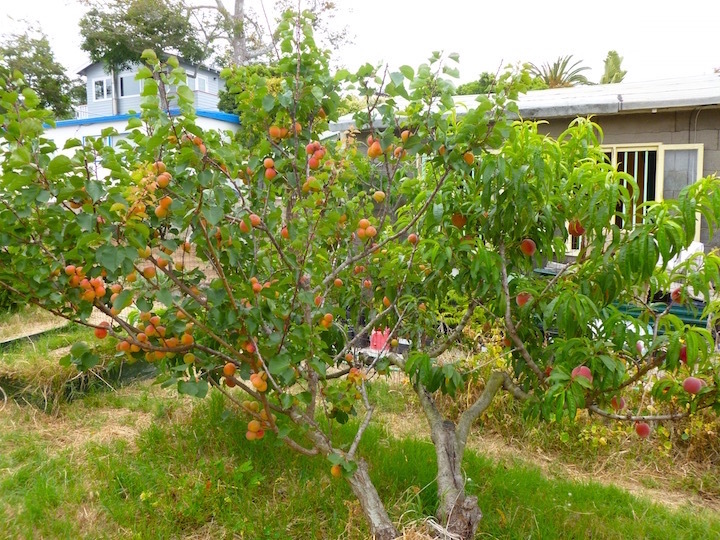 This landscape(3 in-ground photos) was installed about 30 to 40 years ago,..
(Click on title for more info) Nice medium flavor, meaty, low fibrosity, medium to large fruit - 5 to 6 inches long, usually less than a pound, about 12oz, no disease problems, beautiful fruit, yellow-peachy skin with occasional rouge/pink blush, and some innocuous darker specks, yellow-peachy colored flesh, good productivity. Banksia prionotes, a Western Australian native, growing in Valley Center; red-leaved Leucadendron behind at right. Malvaviscus arboreus, grows in a brambly fashion. Fills in airy space, informal, intertwines amongst other plants. (Click underlined title to see more) Vulpia myuros, a common aggressively invasive annual non-native annual grass that grows in wild areas of the San Diego region, native to Europe, and gets up to about a foot tall. Another caution about it is that it's highly flammable if ignited when dry. Peach and Apricot on the same plant/'tree', by grafting. I do this, I did this. Mid Pride Peach on right, probably Royal/Blenheim apricot on left(scion from old tree in old Pt. Loma property in the La Playa neighborhood). 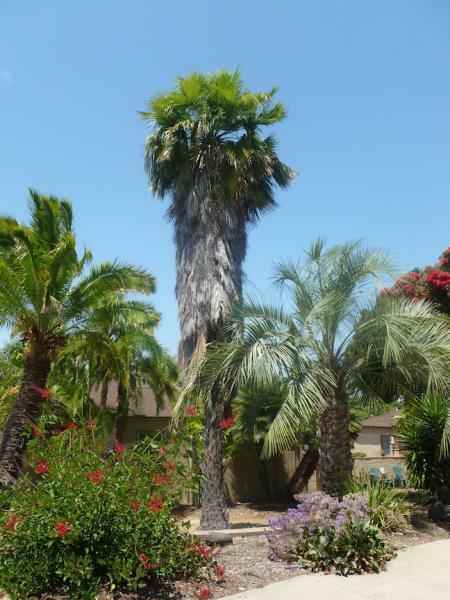 (Click on underlined title to see more)The Bismarck Palm has silvery to blue-grey-green foliage color(described as 'glaucous'). 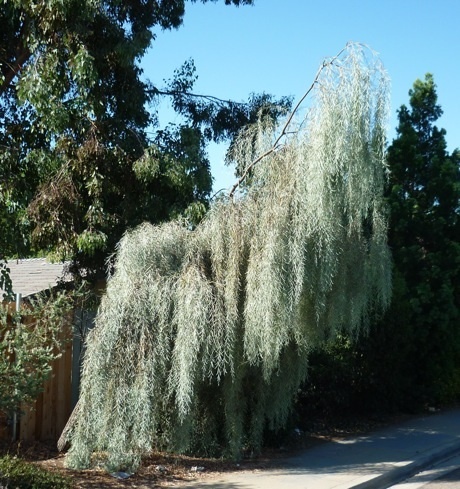 Green leaved strains are also available but the glaucous strains do better in SoCaL and other similar climates. 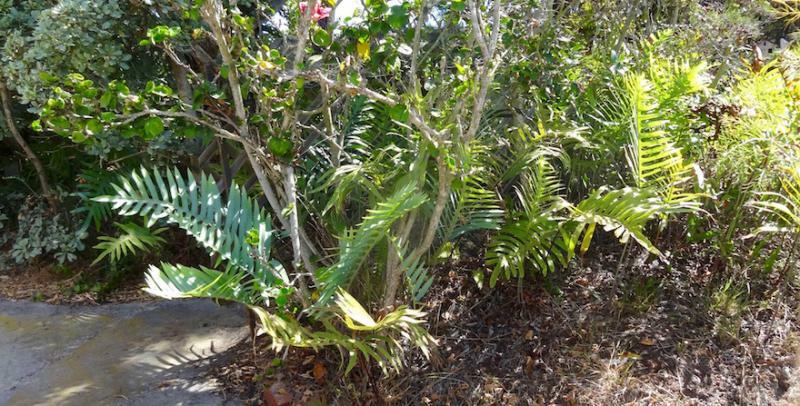 Grows to around 40 plus feet to the top of the foliage, and with adequate conditions can do so in about as many decades, and potential to 100 feet in a century. (Click on the underlined title to see more)Brahea brandegeei, a less robust replacement for the very common 'tall skinny telephone pole' palm(Washingtonia robusta - Mexican Fan Palm), which it can very much resemble, depending on the 'strain/type-lineage' of B. brandeegii, but grows much more slowly, about half as slow. In the photo it's the palm in the middle with the old leaves 'petticoat' along trunk. It's about 25 to 30 feet tall, and probably 50 years old. Eucalyptus rhodantha, aka Rose Mallee, gets about 10 to 15 feet all around, loosely and slowly. A see through gawky big bush or small tree. Silvery-white to silvery-blue-green leaves. Blooms in Spring with red stamens yellow tipped. Photo location: Cubic Corp. in Kearny Mesa.